I first visited Quique Dacosta in 2009. Since then, the food has only gotten better. The menu has been redesigned and simplified with more focus; it now tells a story. The dishes have less added sweetness and really take advantage of the restaurant’s location by the sea. Reflecting back on my recent meal, I was deeply moved by Chef Quique Dacosta’s ability to use local ingredients, combine them with local Valencian traditional cooking, and build from that base a truly inventive and modern cuisine. His cooking is inspirational and, to date, this is the best non-Japanese meal I have had. Over the course of three meals, we were brought on a comprehensive and well-organized tour of Chef Dacosta’s cooking. My first visit meal started with a dinner. The following day my friend the ulterior epicure and I basically hung out all day at the restaurant. We had two more meals. I am writing about the second of those three meals, which was my favorite. Amuse bouche – The meal started with a collection of amuse bouches and a glass of cava. A rapid-fire succession of cinnamon basil, kalanchoe greens and oil, cold hibiscus tea with chicory, pickled raïm, snails, shrimp cakes, kumquats filled with flying fish eggs, and hazelnut oil. The amuses hit all the spots on the palate: sweet, savory, salty, hot, and cold. An assortment of delicatessens – Our first course was salty: a colorful gradient of cured roes and fish. From left to right, we had salt-cured and sun dried fish roes of bonito, lingfish, and sea bass. We were also served aged octopus with a drizzle of olive oil; the octopus had a bitter taste and the dab of sweet olive oil helped to temper it a bit. The saltiness of this course seemed to increase my appetite, by the end I was starving. Cereal paper - A thin crispy wafer of grains to accompany our salty fish roe. Pickled spring onions - Served alongside the salted fish roes and cereal paper were sweet bulbs of spring onion. The assertive acidity of the onions seemed to reset my palate between bites of the roe salty. Dehydrated figs - Our second course, a crumble of dehydrated green figs served atop a fig leaf, was a light sweet and crispy snack. Dew - Chilled salicornia and ice plant beneath a shaved ice caipirinha. My dining companion, the ulterior epicure, immediately commented that the gelee tasted “leathery” and could possibly contain a dash of tequila or mezcal. This dish was cool and refreshing with vegetal undertones. The crisp of the ice plan bridged the gap between the gelee and the smooth sea beans. Piquillo Pepper – After our first bite, our waiter asked if we knew what we were eating. Only that point did I realized it wasn’t piquillo pepper. What we were eating was dehydrated watermelon re-hydrated with charred piquillo syrup. The texture was indistinguishable from grilled piquillo pepper. The dish was adorned with small whole mustard seeds which looked like pepper seeds that had spilled out. The seeds even developed a thin albumin-like coating, really completing the effect. The syrup was extremely sweet, but the subtle spice from the mustard seeds helped to temper that a bit. The concept of this dish was brilliant. Avocado - A smoked wedge of firm avocado bathing in a light bonito broth, topped with shaved smoked avocado seed. The avocado was firm enough to require a knife, but still very creamy. Its texture was very buttery but the shaved smoked seed helped cut through the fatty mouthfeel. The dashi-like broth also helped bring out the latent meaty flavors in the vegetable. This was a very simple but somehow very satisfying dish. Chufas - Cocoa-covered foie gras and sliced tigernuts floating in a truffle-oil cream. Tigernuts, or “chufas” in Spanish, are a starchy and fibrous nut with a crunch like watercress but a flavor like watered-down peanut butter. They were a bit pasty when eaten raw (our waiter brought us a few to try) but when sliced thin they complimented the creamy truffle broth. The cocoa-foie gras consisted of chilled chocolate just barely holding together a thin foie gras cream that spilled in the mouth. The sweetness of the foie gras with the nutty flavors of the tiger nuts and the aroma of truffle oil made this dish intoxicating. This course catapulted my view on the meal thus far from outstanding to awestruck; Quique Dacosta is not only creative and original, but has the palate and understanding of textures and flavors to match. Just wow. Tomato - Frozen shavings of distilled tomato snow covering sun dried tomatoes. The dish was drizzled with what tasted like pepper-infused olive oil. As a whole, it tasted like frozen gaspacho, with a subtle cheesiness coming from the pepper oil. Peas - This plate embodies spring: a cool sweet pea cream broth with wasabi-infused tobiko roe and spring pea shoots. The fish roe, which usually clumps together, dispersed evenly in the broth adding a short-lived spice to each bite. I didn’t taste much fishiness from the roe, rather, it seemed they were used more for the textural component — miniature bursts of spice with each bite. The fresh pea shoots amplified the dish’s apparent freshness. This was one of my favorite courses of the meal, a dish that at first glance appears simple, but is far from it. Local baby squid - Local squids dunked in boiling water to partially cook them, served with a concentrated shellfish broth. The squids were creamy and mildly salted. The concentrated seafood shot was very salty, and helped bring out the shellfish flavors in the squid. I loved this dish. Oyster - A plump oyster gently cooked in its own seawater. The oyster was served on a bed of piping hot rocks with seaweed found from the area where the oyster was harvested. This oyster had no saucing other than its own natural salty and briny juice. This was simply delicious, perhaps the first time I truly enjoyed a cooked oyster. Fresh spring onions - Three sheets of spring onion bulb acting as a bowl for a drizzled shellfish sauce. 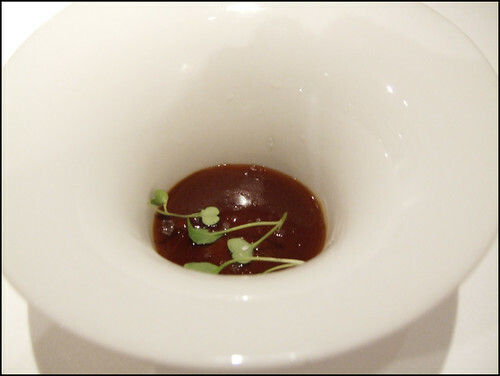 This was a dish where the dominant ingredient was the sauce, and the onions merely a vehicle to collect it. I didn’t understand the concept of this dish, and its flavor was not particularly exciting. A tasting of local prawns - This is a dish where Quique Dacosta teases us with the local ingredient quality. Denia’s shrimp, langoustines, and prawns are perhaps the sweetest I have ever had. 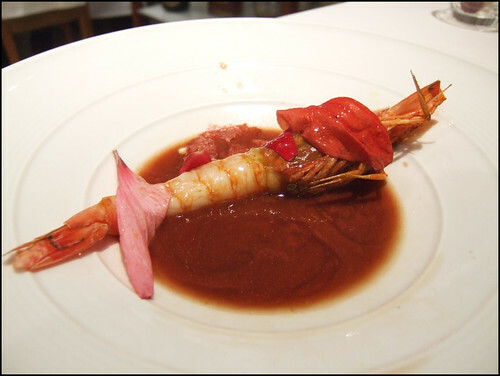 In this dish a single prawn is presented in three different parts: first the tail, lightly blanched in its own seawater on a sauce made from its roe. Then the deep-fried head and legs with part of the shell holding a reduction made from the brain. The third part is a shellfish reduction with Cognac filled with a gelatinous liquid dumpling filled with juice from the shrimp brains. This dish was exceptional, just the fresh taste of prawn presented from three different angles. 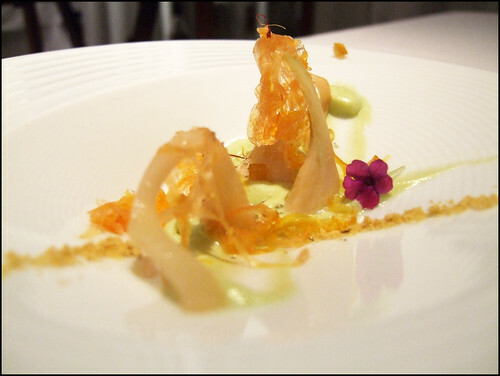 Arroz de galera - Uni-infused risotto with sage, crowned by thin layers of raw mantis shrimp. The rice was firm and chewy giving it structure to support the sea urchin without it turning into a goey mess. The interlaced uni had a clearly defined shape. The mantis shrimp, unlike the Denia prawn, was not sweet, rather it tasted strongly of the sea. There was also a temperature contrast between the warm risotto and cold shrimp. This was one of the highlight courses of the meal, utilizing Valencia’s traditional rice recipes with local shrimp. Seaweed stew - This was a repulsive course, that I actually enjoyed. I hope that makes sense. This was a stew made from algae and barnacles served with seaweed toast. The stew tasted like licking a dock that had been submerged in the seawater for a long, long time. It tasted slimy and salty, like algae from a wet rock. I didn’t like the flavor, actually I hated it. But I loved how, for a few brief minutes, I felt like I had gone for a swim in the adjacent Mediterranean. Its flavor was very intense and concentrated. It was very challenging to finish this course, two bites was more than enough. Monkfish - Thick medallions of breaded monkfish in a shellfish broth with sheets of seaweed and a crustacean roe paste infused with mint. The generous chunks of monkfish were pan seared making the surface crunchy and leaving the inside lean and moist. The portioning was very generous making it tough to finish the entire course knowing we still quite a few to go. Almonds - A Spanish ajo blanco of shaved frozen white almond milk with garlic. The dish was generously seasoned with olive oil. This course was light and refreshing without any sweetness. Condensation began to form on the frozen plate as we ate this course, which made the course seem even more refreshing. Beet root - By this point in the meal it was clear we weren’t going to be served much, if any, meat. Maybe that’s one of the reasons I enjoyed it so much. 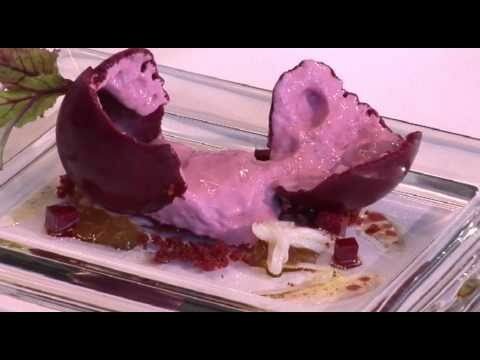 This next course, a deep red beet root violently splashed with a meaty beet sauce captured the essence of a heavier meat course without meat being the principal ingredient. The sweetness of the beet and saltiness of the beef reduction went together quite nicely, creating a flavor much like during Thanksgiving when cranberry sauce brushes against gravy. This was a pretty cool concept. “Which came first?” - An egg-shaped white asparagus gelatin carrying an amber-orange colored chicken stock “yolk” that poured out when eaten. Halved blanched almonds dotted the yolk. Despite looking and textually ”feeling” like an egg in the mouth, this tasted like an asparagus cream soup. This was a remarkable concept. Bone marrow – This was perhaps the coolest course of the night, even if it shaved five years off my life. On the plate we saw what appeared to be a rather large veal bone filled with some kind of liquid. In reality, it was a gelatin made from heavy cream and bone marrow shaped like a bone, filled with a veal stock. Chef Dacosta really got the texture of the gelatin right — it glistened in the light as a bone would, even with the same color striations. The plate was dotted with a concentrated licorice paste, and our waiter told us to taste a bit of the paste after eating the bone marrow gelatin. The licorice’s concentrated stevia-like sweetness combined with the residual fattiness in my mouth to create an almost sweet meaty butter flavor. I loved this dish; I just wish I didn’t have so much guilt for having finished it. Matcha tea - A trio of matcha tea desserts: a green tea macaron, an apple foam dusted with green tea, and a compressed granny smith apple soaked in green tea. Overall a nice transition from savory into sweet. Orange blossom honey - A light and fluffy honeycomb-shaped spongecake drizzled with orange blossom honey. Interestingly, the honey tasted more like citrus than it did like honey. It also wasn’t overly sweet. And just like that the meal was over. Hardly any meat, lots of shellfish, and very light on the dessert. This man was reading my mind. This was a magical meal and certainly at the same level as El Bulli. And when El Bulli closes it will be quite sad; but one door closed opens another. I am confident that Quique Dacosta will finally garner the attention it deserves. I had my first meal with Quique Dacosta in 2009. At that time the restaurant was still called El Poblet. And while I just returned from a more recent visit, his cuisine left such a strong impression on me that I’m going to share my experience from two years ago based on my notes first, with a more extended write up to come later this week. Last week’s planned lunch at Quique Dacosta quickly turned to a 3-meal multi-day gluttonous gastronomic excursion. Quique Dacosta, at first, seems out of place. It’s in the center of a tourist town and the tourists don’t eat there. During high season, a large portion of the town is foreign: most signs are in German. Regular ferries carry young club-goers eastward to the Balearic islands, while older couples stay behind to enjoy the serenity of the Mediterranean. Except the restaurant is in exactly the right place; it’s clear that the local seafood has had a profound influence on Dacosta’s cooking. Though Quique Dacosta doesn’t receive nearly as much hype as his compatriot Ferran Adrià, I’d argue that his cooking is equally as exciting. And he’s just getting started. When I made it to Quique Dacosta in 2009 I was blown away by his creative use of local shellfish and vegetables. When I returned in 2011, I was even more impressed. 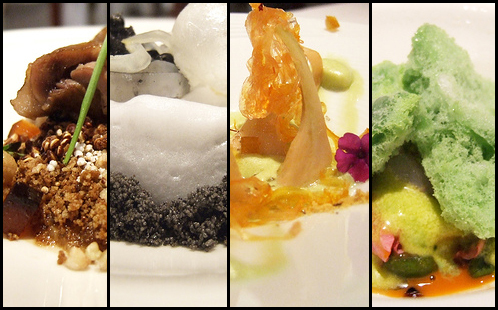 Our meal began with Universo Local, the more extensive of the two tasting menus. 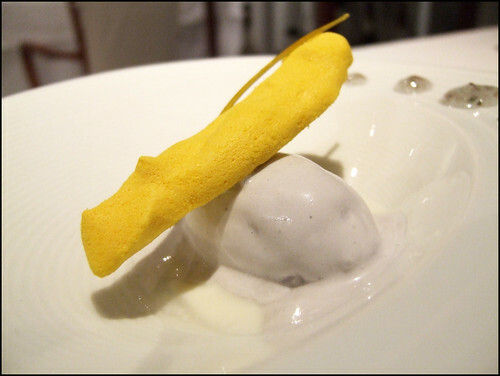 White truffle from montgo - A truffle-shaped dehydrated parmesan mousse with the strong fragrance of white truffle. The concentrated aroma was noticible even before the truffle was placed on the table. This was Dacosta’s version of a gougère, the French cheesy puff pastry. The flavor of this dish was a bit too sweet for me, but its fragrance was intoxicating. It was also light and fluffy — no more than two bites. 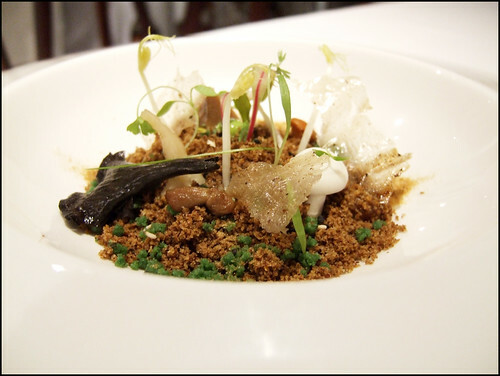 The Living Forest - A collection of mushrooms and greens laced with black truffles julienne growing from an edible dirt floor. The dish was beautiful and evocative of a crawl through the forest floor. It was an edible piece of art that transported us to the forest. Despite its beauty, I thought this course too was a little too sweet. I was beginning to get worried that Chef Dacosta had a heavy hand with the sugar. Thankfully, this assumption turned out to be wrong. Primavera - “Spring on the plate” – Lobes of foie gras mixed with raw local prawns, decorated with candied leaves and flowers. Oh my god! 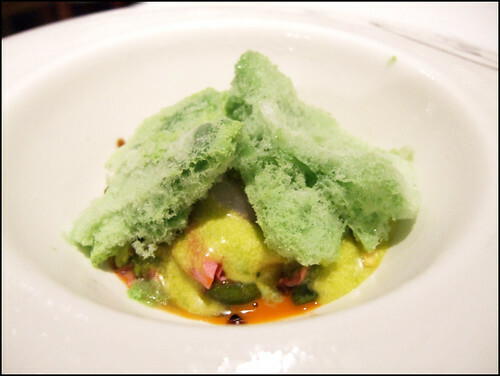 The creaminess of the sweet prawns blended with the fatty foie gras making them taste even richer. The buttery taste of the liver amplified the prawns’ sweetness. This was a dish where the very subtle sweetness from the candied leaves worked — they complimented the shellfish. Overall this was an excellent dish, both beautiful and delicious. 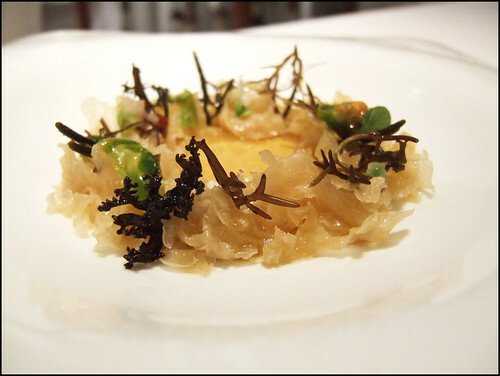 Essential oyster - A thick slab of oyster atop an oyster leaf, topped with a transparent oyster gelee. This dish took everything I like about oysters: the soft meaty texture, subtle brine, and sweetness, and amplified them. The algae used to make the gelee seemed to pair perfectly; it extended the texture of the oyster making it taste like a single piece of enormous shellfish, without diluting the flavor. The oyster leaf further fortified the briny taste. This was a strong taste of the sea, fresh and briny without too much salt. I loved this course. Iceberg “evoking a hit of the sea” - Continuing with the shellfish theme, algae and sea barnacles covered by a crab and almond “cloud.” This was another awesome dish, a play on textures concentrating on the taste of the ocean. 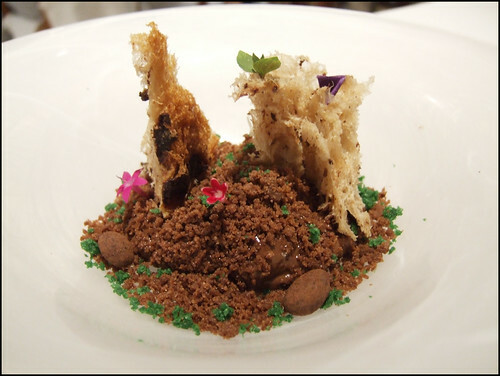 The Haze - A miniature sweet pea forest of almonds, mushrooms, small flowers, black truffle, and edible dirt. The “forest” was served over dry ice creating a fog that covered our table. The fog actually added to the fish by re-creating the wet damp feeling of walking in the forest in the early morning. We were transported to the woods. Our waiter brought a pair of specially made tweezers to eat this course item-by-item which heightened our appreciation for the ingredients; it forced us to eat carefully. The diversity of textures on this plate, from crispy peas to soft mushrooms made it really balanced. This was one of my favorite courses of the afternoon. Every bite was different. Wood - A generous lobe of roasted foie gras with the skin from toasted Jerusalem artichokes in a duck bouillon. The toasted skins added a smokey flavor that helped counterbalance the fatty mouthfeel from the foie gras. The duck broth helped to rehydrate the artichoke skin. This dish ushered in a sharp transition from light seafood to creamy offal. I thought the portioning of the dish was a bit large, but then again, can one have too much foie gras? Ashes - A play on texture and colors in this dark dish. The ink-black and charcoal colors combined with the crispy squeaking from the dehydrated chips made the experience of eating this dish feel like rummaging through a pile of spent firewood. The landscape was fantastic. The flavor was salty with hints of sweetness and a deep earthy flavor from the mushrooms. The drying of the mushrooms to create this dish actually concentrated their flavor. Denia shrimp - It’s worth visiting Denia just for this local variety of shrimp. Gorgeous colors of red, orange, and brown streaked by green and lavender inside. These prawns — lightly boiled in seawater — were sweet and meaty. They were served by themselves — no garnish or saucing. We were instructed to eat as much of the shrimp as possible — head, brain, tail, and even some of the softer legs. The only thing this course was missing was a second round. These were some of the sweetest shrimp I’d ever had. Denia’s pink prawn - It was this course that showed me Quique Dacosta sure knows what he is doing, or at the very least, has an uncanny ability to pander to my palate. The previous course introduced the raw natural beauty of Denia’s local shellfish. This course improved upon it without distracting from the natural flavors. Both courses and their succession showed that Dacosta has a very fine understanding of the area’s local ingredients, when to step in to enhance their flavor, and when to step back and let them speak for themselves. The prawns were sauced in a broth made from the shrimp’s brain and decorated with local edible flowers. This dish was stunningly beautiful and was probably the best tasting prawn I’ve ever had. This was my favorite course of the afternoon. Sea beet - Sea urchin in a beet root emulsion. This presented sea urchin in a way I hadn’t tried before, with a sweet vegetal foundation. This course was a bit heavy on the sweetness, and the cooked flavor of beet distracted from the sweetness of the sea urchin. It wasn’t my favorite of the afternoon but I was still in ecstasy from the previous courses that I didn’t think much of it. Coral - Sea urchin, crab, salmon roe, and algae. This was a fantastic course — a collection of shellfish brought together by the subtle vegetal bitterness of algae. A potpourri of textures from the sea. This course was also served cool which made it particularly refreshing. It was like a briney seafood palate cleanser. Mark Rothko Saffron – If this course doesn’t represent “art on a plate,” I’m not sure what does. A generous filet of pan fried red mullet with a puree of celeriac on a transparent glass plate. Underneath the plate was a maroon-red color gradient used to visually turn the dish into a piece of art similar to the work of Rothko. This dish tasted great too: smooth and juicy red mullet that developed a shellfish like flavor crowned by crispy skin. Senia rice - Black rice topped with black truffle, braised woodcock, and black truffle caviar. This was an incredible dish similar in appearance to the previous “ashes” dish except topped with gorgeous black truffle. The aroma of truffle was incredibly fragrant, and this paired very nicely with the more mild senia rice. The crispy “truffle caviar” added textural contrast making this one balanced dish. This was another highlight of the afternoon. Orange in the winter - Bright and sweet blood orange in various textures: foam, crisp, cold sorbet, whole fruit. This was really refreshing and the acidity from the citrus completely reset my palate. Litchis - A tasting of lychee with different textures: meringue, gelee, powder, foam, and cream. The sweetness of this course was more pronounced, but the sugar helped to bring out the flavor of the lychee. I loved this dessert. Matcha tea - A matcha tea sponge with matcha tea ice cream. There was a very subtle bitterness from the green tea which tempered the sugar making this a balanced dessert. We finished this meal with a great big smile on our faces. The creativity of the plating in combination with the clever flavor combinations made this one of the most memorable meals I’ve experienced. Even more, the creativity wasn’t random: the dishes had a strong focus on local ingredients and the natural gifts Denia had to offer. In just a few hours Quique Dacosta had jumped on my radar from a relatively distant chef to one with whom I was already planning a return visit. I left the meal in awe of my experience and the flavors I had tasted. There was something special here. And I don’t think the restaurant is getting the attention it deserves. Every year, one restaurant captures my attention like no other. 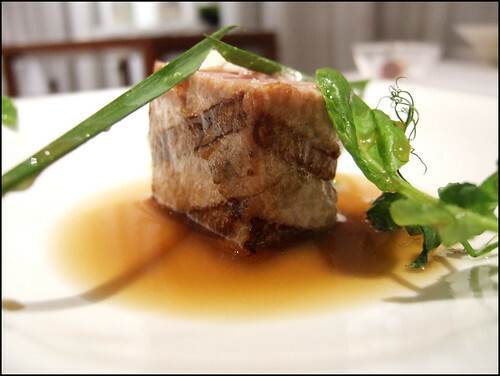 In 2004, Manresa began what has been tremendous run of meals. Ludo Lefebvre’s Bastide of 2005 awoke my palette to the wonders that might lie across the sea and, no doubt, provided inspiration for my 2006 European adventure. In 2006, it was Ideas in Food’s two stellar meals at their former Keyah Grande restaurant. For 2007? From top to bottom, there may not be a restaurant with greater attention to detail and production values than El Poblet. The restaurant is quite modern with a huge open kitchen as you walk in. The menus nearly qualify as works of art. In the technique/ingredient matrix, you would be hard-pressed to find a restaurant that uses such high-quality ingredients for their experiments. And in the realm of dining as experience, despite the crass commercialization of the beach ghetto Denia, El Poblet (the restaurant and food) has a Shakespearian quality – poetic and magical. Where Etxebarri missed great expectations, El Poblet handily surpassed even higher hopes. This is a destination restaurant of the highest recommendation. Of all my meals this year, only the Les Ambassadeurs truffle meal may have been better. 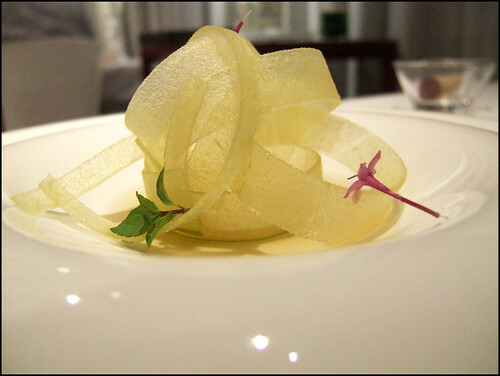 Dated 2001, and reinvented for 2007, conceptually, it shows the thinking of a chef trying to explore a new cuisine, a signature. This had a post-modern sensibility – mix high end with elements of pop culture – challenge traditional assumptions and relationships of pairings. It also might serve as an exploration into the memories of youth (Coke, or is that Rum & Coke) influencing taste, a possible nod to Heston’s research from Fat Duck. Super smooth, creamier than French Laundry’s foie, the rum and coke gelee was nearly too sweet but just restrained enough to keep the dish balanced. The salting was masterful. Excellent. The (candied?) orange brightened the artichokes earthiness but the saffron’s shredded gelatin, while an interesting texture by itself, akin somewhat to bird’s nest, seemed superfluous and it didn’t add to the dish. Very Good. The Opinionated About review caused some ripples in the foodosphere by proclaiming experience and abstraction as new culinary frontiers. An argument against this notion is the traditional symbolism, and ritual, found in many cultures around their food. However, symbolism and abstraction are entirely different; and the arguments seemed to get caught up in semantics. This dish was experiential and, with my limited dining experience in mind, I think it’s a bold new frontier. 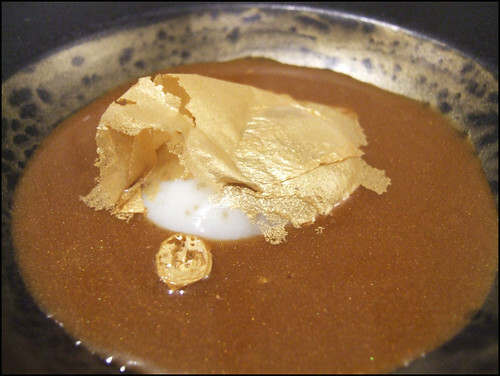 Other restaurants crossed over into the intellectual realm long ago – French Laundry with its plays on classic dishes; El Bulli and WD-50 with their new takes on ingredients and traditional flavor pairings; Fat Duck with memory and influence; and countless others. 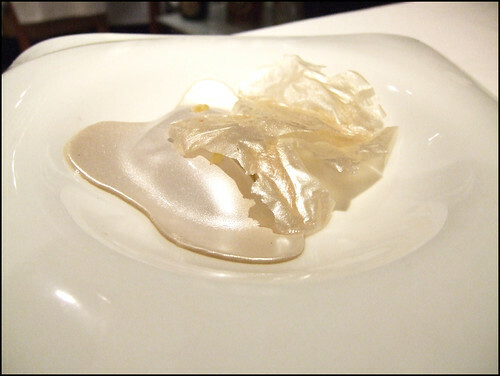 El Poblet seems different with these Abstraction dishes (this one, Abstraction of the Sea, Hoarfrost, and The Other Moon of Valencia below.) The ingredients were nonrepresentational in a culinary context; they did not point back to themselves in meaning or intent. The experience was the dish – not the mind trying to link symbol to food item. Whether this becomes important or not is for history to tell. Mushrooms mixed with a brown sugar sand, it had the crunch and taste of walking through a forest. Each bite yielded different aspects of the earth. The entire dish had the crisp smell of forest air. The brown sugar was just a touch too sweet but its portions could be easily controlled to maintain the delicate ecosystem. Excellent. The best realization of the four experiential experiments. The mushrooms compose a majority of the dish yet they clearly mimicked the look, feel, and taste of seaweed. The smells and tastes of the ocean breeze were so vivid that one might question why it’s labeled an abstraction. This is an evocative cuisine. Excellent. Slightly warmed oyster with a pure oyster flavor but one has to question the point. The paper dissolved immediately and felt slightly inorganic. The Gillardeau oysters, slightly warmed, quite meaty, were of very high quality. A more technical explanation of the dish can be found at TastyTech – an interesting take on the dialectics of the dish. Very Good. The meal was like walking through an epic classic poem – walks in enchanted forests, the sea of a great voyage, and with this dish, magical fruit. No dish evokes a Shakespearian magic like this one. 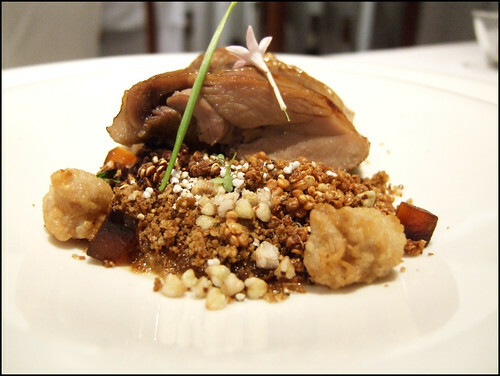 The place, the meal’s progression, and this dish intersect in a Midsummer Night’s Dream. The crisp cool evening. The hoarfrost (see the technical definition), an olive oil emulsion, captured the essence of a frosty night as it imparted a cool chill. Its smoky flavor, as light and subtle as Etxebarri’s dishes, floated in the mouth and evoked a sense of burning fires in the heart of winter. Raw shrimp sat underneath. Very Good. Roasted with a rose/prawn infusion with the slightest of rose hints. Prawn was perfectly cooked. Exquisite presentation. The seafood at El Poblet is second to none; the Spanish seem to pride themselves on procuring the freshest seafood possible. Excellent. Possibly more post-modern games, Chicken of the Sea, an exemplary piece of Mediterranean tuna with a slight smokiness. The roasted tuna and chicken sauce added body and depth but one wonders if they were necessary when the ingredient was as good as the tuna. Excellent. 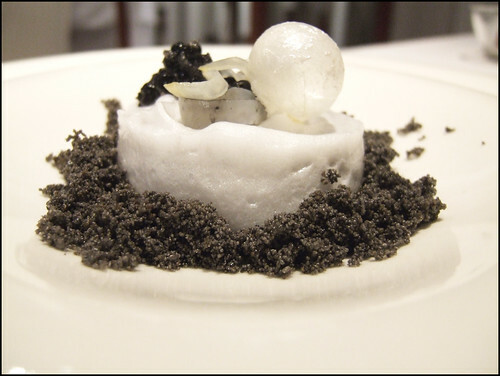 More Shakespeare, an all squid dish – crunchy ink balls, squid foam, and squid with more ink under the foam. A consensus of blogs liken this as the best but I simply don’t get it from a taste perspective. It was random to me, none of the elements interacting with the other. What was the point of the foam? A beautiful and magical dish but too conceptual. It did capture the mood of fishing during a late night but its culinary merits were minimal. Good. Perfect rice, each grain perfumed by the cherry & rosemary. The smoked eel added a slight smokiness to the dish with the smoke and fruit flavors mixing. 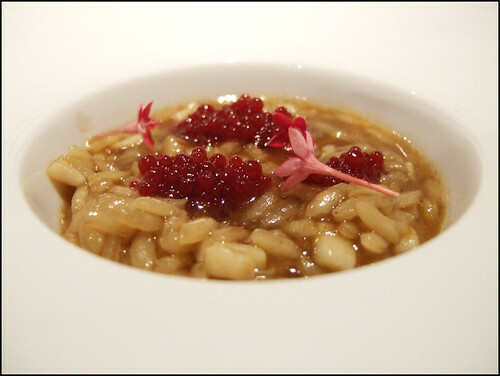 Chef Quique Dacosta has written what some call the bible for rice cooking and this dish supported that opinion. Very Good. The excellent egg was marred by an overpowering coffee sauce. The richness of the egg was lost in the heaviness of the sauce. This was the weakest dish of the night. Ok.
My notes were sketchy on this one and the photo doesn’t bring back much from the memory. 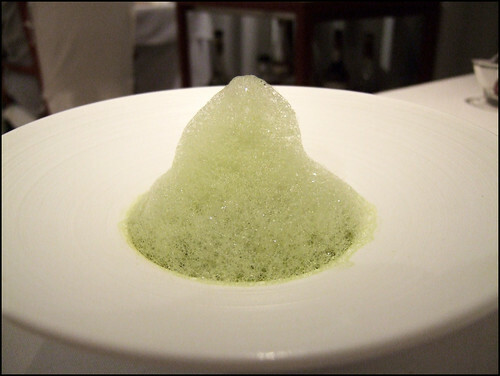 Green pea foam, licorice infusion, pasta; interesting texture, foam intensely green pea, monkfish skin gelatinous. Good to Very Good. Lamb, quinoa, amaranth, & tapioca. Toasted cereals were a treat in themselves and stole the show. Lamb itself too gelatious for my tastes (parts were braised, others possibly sous-vide.) Good. Violet ice cream, yogurt, dehydrated pineapple, & aloe. Ice cream and yogurt both had excellent texture, more intense than normal violet, aloe played with the continuing theme of coolness throughout the night. Very Good.